When I was thinking about buying a caravan, one of the aspects I was nervous about was reversing with the caravan. At the time, my car didn’t even have a tow bar, so I couldn’t practice with a trailer. After purchasing the caravan, I explained to the campground receptionist at the first place that I had literally JUST bought the caravan and would appreciate an easy site. She found a spot where I could drive straight in – perfect. I happily procrastinated about learning how to reverse for a while longer. It’s really just practicing. The second campground I stayed at, there was no-one watching, so I gave it a good go and started to understand how the caravan moved. I’ve become competent and have been able to reverse into all the sites so far… even if it takes a couple of goes. Have a visual in your head with what direction the caravan and car turns. Focus on what direction the car needs to turn, as it’s easier! 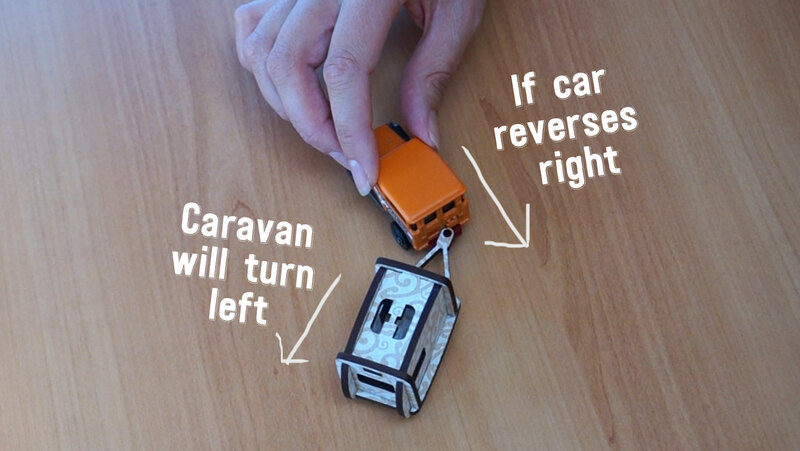 A tip from a truck driver /caravan owner – give yourself plenty of room to reverse. Go well beyond your site and turn the caravan in a gentle curve. Explain to the campground owner that you’re still patchy with reversing and ask for an easy site. They have sites that are smaller and tighter, so it’s worth mentioning. If someones watching, chances are you’ll muck-up. It’s happened to me plenty of times! The more you do it, the easier it becomes – honestly. I’m not perfect yet… but I’ll get there. Practice, practice, practice. What are your hesitations about buying a caravan? I’d love to read them in the comments below.